Vaccination appointments include a complete physical exam and administration of required vaccines. The duration of each appointment is 30 minutes. Our veterinarians may recommend additional procedures based on their observations during the physical exam. You have the right to decline these procedures or you can ask for an estimate before proceeding further. Each medical appointment will take at least 30 minutes and may go longer. Please don't be hesitant to ask for an estimate before proceeding with any diagnostic testing or procedure. We may need more than one diagnostic before getting in to a confirmatory diagnosis. The client has the right to decline a diagnostic or procedure and in that case the clinic will not take any responsibility on the outcome. We try our best to accommodate any emergency. Please do your best to call us before arrive at the clinic to allow our staff to prepare the clinic for your pets arrival. The duration of the appointment is not predictable. We may refer you to an emergency clinic if your pet requires 24 hour care or hospitalization. Patients may need hospitalization for 24 hours or more. Our clinic is not equipped for 24 hour monitoring and we strongly recommend a full service emergency clinic for overnight hospitalization. We perform surgeries 7 days a week but require early confirmation for surgeries booked on Sundays. Surgery admission is early morning and our veterinarians have the right to deny the procedure, if you arrive late for your appointment. Intravenous fluid administration is mandatory in both feline and canine spay surgery. We recommend blood work, IV fluids, microchip, E collar and pain medications to go home with after surgery. Prior up-to-date vaccination is highly recommended for surgery and the clinic will not be responsible, if your dog or cat gets infected with a disease from the clinic due to insufficient vaccination. Discharge time is after 3 PM each day. All new clients should fill out a registration form. Please come 5 minutes early to allow sufficient time to fill out the form. You can also find the form on our website if you would like to fill it out in advance. We have a 100% money back guarantee on any prescription diets. We do not accept any OTC product returns and no money back guarantee. We need 48 - 72 hours to fill any special orders. Some products may be on back order and the clinic will not be responsible in such delays. We need 24 - 48 hours for any prescription refill. The veterinarian has the right to deny your request after checking the medical records. We do not accept returns or provide refunds on any medications. Payment is due at the time of service. We do not accept cheque or American Express. We accept cash, Master card, VISA and debit card. Please turn off your cell phone or any electronic devices inside the exam room to avoid any kind of interruption during examination. The safety of you, your pet and staff is our top priority. Please keep your pet properly confined inside the clinic. 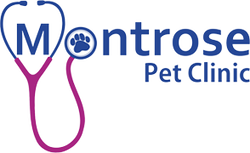 The clinic may use a muzzle or other similar tools to ensure the safety of our staff and other clients, if needed.